THE PRESENTATION OF TROPHIES FOR THE OVERALL GOLD SERIES CHAMPION took PLACE at FRAMES SNOOKER & POOL CLUB, Weston-super-mare prior to the gold masters on the 6th april 2019. The first in a series of five top amateur snooker tournaments got underway at Frames Snooker & Pool Club, Weston Super Mare. This prestigious series is promoted by the West of England Billiards & Snooker Foundation (WEBSF) and sponsored by Totally Reward. This was the first event that the WEBSF has held at the Weston Super Mare club and the players could not have been more complimentary about the presentation of the tables and the service provided by the staff. The tournament began with four groups of seven players playing a round robin format to find two qualifiers from each group that would qualify for the knock-out stage. Group A was dominated by a newcomer to the series, Mike Hodge from Newport, Wales. Hodge won the group undefeated, dropping just one frame. Hodge made breaks of 60 & 93. Haydon Pinhey (Plymouth) finished in second place. After losing his first match 2-0 Pinhey found some form to win all his remaining matches with breaks of 50,51,70 & 101. Jed Mann (Hereford) was the other break maker in this group posting breaks of 73 & 77. Alan Tunney from Torquay won though from group B, also undefeated and making a fine 91 break in the process. The other qualifier from the group was James Lee, also from Torquay. Lee made breaks of 50,57 and two 68’s. Andy Neck, Newton Abbot and Andy Smith Worcestershire made breaks of 81 & 82 and 61 & 71 respectively. Group C saw two Plymouth players qualify; Dale Branton wining the group with Steve Brookshaw in second place, Brookshaw had just returned from the World English Billiards championship where he took the scalp of former multi-world champion Geet Sethi, in a 45-minute game. The final group D saw the pick of the group stage breaks; Billy Ginn took the highest non-qualifier break prize with a 95; Andy Symons (Tavistock) 64,78 & 82; Aidan Murphy (Bristol), at just 14 years old, 65,76,76 & 79 and Jason Whittaker 50,53,70 and the highest of the tournament 103. Symons won the group with Whittaker in second place. The knock-out stage began with quarter finals; Hodge (60 break) dispatched Brookshaw 2-1; Tunney beat Whittaker (53 break) 2-1; Pinhey beat Branton 2-0 and Symons beat Lee 2-0. The semi-finals saw two closely contested matches taken to deciding frames; Tunney edged out Hodge and Symons (73 break) accounted for Pinhey. After a full day of snooker, lasting some ten hours, Symons had the edge over Tunney in the final, posting two frame-wining contributions of 72 & 57 to take the spoils and head-up the ranking table. The top 16 players at the end of the Gold Snooker Series will be invited to play in the Gold Masters later in the season. WEBSF Tournament Director said, “Adding Frames Snooker & Pool club to our list of tournament venues has proved a real winner. The high quality of match-play snooker seen here today is reflective of the conditions and the atmosphere of the venue. We will be returning here again in January for an Open Billiards & Snooker coaching day, where help and advice will be available free of charge to anyone that comes along.” Anyone interested in attending the Open Coaching Day can book a place on the WEBSF website or contacting the club. Players interested in entering WEBSF events or potential volunteers willing to get involved with the work of the WEBSF they should contact Steve Canniford, Mobile 07891940995 or visit http://www.websfsnooker.com or WEBSF Facebook. Thanks to Frames Snooker & Pool Club, Weston Super Mare for hosted this event. Just a week after retaining the West of England Billiards & Snooker Foundation (WEBSF), English Billiards Open, Plymouth’s master cueman Steve Brookshaw switched to snooker to win the second event of the WEBSF Gold Snooker Series. This prestigious series of snooker tournaments, sponsored by Totally Reward, is played-out over five events in venues around the West of England region. The venue of choice for this event was the 147 Snooker Club, Swindon and after a full day of competitive snooker Brookshaw was met in the final by Connor Benzey, an up-and-coming snooker prodigy from Hampshire. At just 16 years old Benzey is the youngest player to have reached the final of a Gold Series event in the fourteen years the tournaments have been running. In a closely contested final Brookshaw called upon his experience to restrict Benzey, from demonstrating his prolific break building prowess, to win by a deciding frame. In the semi’s Brookshaw beat event 1 winner and recent winner of a tournament at the South West Snooker Academy, Andy Symons from Devon. In the other semi-final Benzey edged out the current West of England Open runner-up, James Height from Bristol. The remaining players that qualified from the group stages were; Billy Ginn (Devon), Darran Lock (Cornwall), Andy Neck (Devon) and Daniel Hall (Swindon). The best breaks in the knockout stage came from Symons 56, Brookshaw 54 and Benzey 68, the latter taking the highest break prize made by a qualifier. The group stages produced the highest no-qualifier break of the day, a superb 121 clearance by Ryan Mears from Hampshire. Like Brookshaw, Mears also excels at both English Billiards and Snooker having contested the billiards final against Brookshaw last week. Although played on the same table, few players excel at both disciplines. Ranking points are gained each time a frame is won throughout the tournament and these are the basis for determining the top sixteen players who will be invited to play in the end of season finale, The Gold Masters, also sponsored by Totally Reward, so every frame counts. After two events Symons holds on to the top spot with Brookshaw closing in by virtue of this victory. Other high risers include James Height, moving up 14 places, Daniel Hall and Billy Ginn up 10 places and Connor Benzey in at 13th, 22 places above the bottom spot! Players interested in entering WEBSF events or potential volunteers willing to get involved with the work of the WEBSF they should contact Steve Canniford, Mobile 07891940995 or visit http://www.websfsnooker.com or WEBSF Facebook. Thanks to 147 Snooker Club, Swindon for hosted this event. The latest event in the West of England Billiards & Snooker Foundation (WEBSF), Gold Snooker Series was played out at Galaxy TQ, Torquay. This prestigious series of amateur snooker tournaments, sponsored by Totally Reward, is played over five events at venues around the West of England region. Twenty-eight players travelled to play and after more than a hundred competitive frames, local Torquay player Alan Tunney and Plymothian Haydon Pinhey came through a quality field to meet in the final. Both players had lost just one frame apiece in the lead-up so a closely contested final was on the cards. However, whilst Tunney maintained his solid consistent form Pinhey wavered, leaving the door open for Tunney to win without too much resistance. In the semi-finals Tunney beat James Lee (Torquay), who like a number of players were suffering after the effects of winter illness and as a result, simply ran out of steam. The other semi-final is where Pinhey may have peaked when he beat Dale Branton (Plymouth) in what was probably the best match of the day. Pinhey took the first frame with a clearance break of 80, Branton made a 52 in the second frame but a 65 break from Pinhey secured the win. The Quarter final results where; Branton beat James Height (Bristol); Pinhey, with breaks of 51 & 54, beat Aidan Murphy (Bristol). This was Murphy’s first quarter final appearance in the Gold series after previous narrow failures by frame count-backs. This, coupled with breaks of 69 and a superb 91 is a significant achievement at just 14 years old; Tunney edged out Andy Symons (Tavistock) and Lee (67 break) was pushed to a decider by Jason Whittaker (65 break) from Torquay. Other notable performances in the group stages came from; Symons for his 52,75 and 105 breaks, the latter winning the overall highest break prize of the day; Darran Lock (Cornwall) with breaks of 52 and a 59 which took the highest break prize by a non-qualifier; Whittaker, for his breaks of 54,62 & 71; Lee for a trio of 50’s and Pinhey who made breaks of 58,71,89 and an 89 clearance. After three events with two remaining, Symons has opened up a slight gap at the top of the rankings, Twenty-seven points ahead of the closest contenders. The chasing pack is led by Pinhey who is closely followed by a number of equally good players. This month’s significant climbers are; James Lee, up seven places; Jason Marsh and Thomas Peasland from Weston-Super-Mare, up six places and Jason Whittaker up five. Players interested in entering WEBSF events or potential volunteers willing to get involved with the work of the WEBSF they should contact Steve Canniford, Mobile 07891940995 or visit http://www.websfsnooker.com or WEBSF Facebook. Thanks to the sponsors Totally Reward, and Galaxy TQ, Torquay for hosting this event. The penultimate event in the West of England Billiards & Snooker Foundation (WEBSF), Gold Snooker Series was played out at Top Q, Gloucester. This prestigious series of amateur snooker tournaments, sponsored by Totally Reward, is nearing a conclusion and there are several players in the frame for this overall regional title. After twelve hours of quality snooker that produced forty-seven, fifty plus breaks, including six centuries, Ben Hancorn from Portishead, Bristol lifted the winners trophy beating Aidan Murphy, also from Bristol, with breaks of 59 & 73. On the way to the final Hancorn was in fine break building form, posting breaks of 63,63,66,72,73 and a superb 133. Murphy, at just fourteen, played exceptionally well for one so young and was deserving of his place in the final. His journey to the final saw him undefeated for nine consecutive matches where he made breaks of 50,51,55,62,77 & 82. This quiet unassuming youngster will feature in many finals in the future, for sure. The remaining qualifiers were losing semi-finalists; Andy Neck (Newton Abbot) and Darran Lock (Seaton, Cornwall). Losing quarter-finalists were; Haydon Pinhey (Plymouth), Mark Vincent (Bristol), Mike Hodge (Newport) and Alan Tunney (Torquay). The group stages produced some excellent break building. In addition to Hancorn’s breaks, group A saw breaks from; Lewis Parnham (Gloucester) 64 & 74; Connor Benzey (Eastleigh) (54); Andy Symons (Tavistock) 60,68 & 89; James Lee (Torquay) 54,58 & 72; Pinhey 52,56,60,119 & 137, the latter taking the highest qualifier break prize and Nick Hawkins (Bristol) 73 & 74. As can be seen by the list of significant breaks posted, group A was made up of high class players. Break builders in group B included; Jay Bullen (Exeter) 63, 75,80 & 105, the latter break taking the highest non-qualifier break prize; Tunney and Jason Whittaker, both from Torquay 57 & 61 and 77 respectively; Murphy’s breaks shown above. Group C; Neck 76 & 111; Hodge 53,89 & 100. Group D; Lock 89; Vincent 83 and Ben Rickard (Cornwall) 66. With just one event left to play, on the 9th March at Jesters Snooker Hall Swindon, the competition promises to be keenly fought out between the nine players that can mathematically take the overall title. Also, between the ‘many’ that can claw their way into the top sixteen places and earn an invitation to the Totally Reward, sponsored Gold Masters, which this season will be held at Frames Snooker & Pool Club, Weston-Super-Mare. 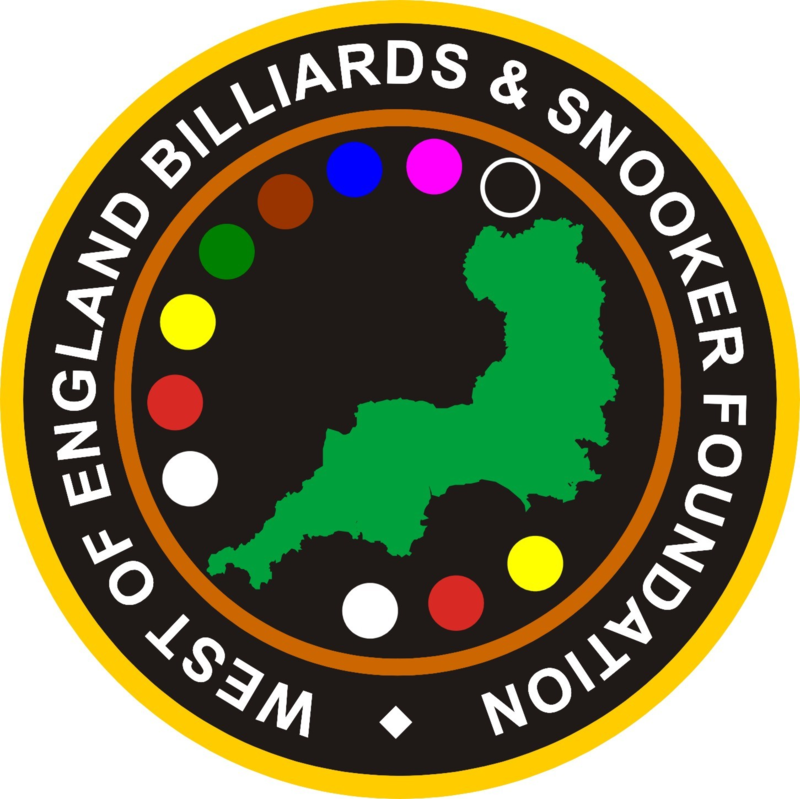 Players interested in entering WEBSF events or potential volunteers willing to get involved with the work of the WEBSF they should contact Steve Canniford, Mobile 07891940995 or visit http://www.websfsnooker.com or WEBSF Facebook. Thanks to the sponsors Totally Reward and Top Q, Gloucester for hosting this event. Top amateur snooker player Andy Symons from Devon gave his all to win the final event of the West of England Billiards & Snooker Foundation (WEBSF), Gold Snooker Series in the hope that he would also take the overall series title. However, even though he had led the rankings all season, it was another fine amateur player, Alan Tunney from Torquay who proved to be the most consistent with the best four out of five event results and be crowned overall Gold Series Champion. At the beginning of the day several players where in the running to take the overall series title which prompted tough matchplay competition from the off. With only two players from each group progressing into the quarter final knock-out stage, Symons would have to win this group with maximum points if he was going to win the overall title. His first match was against a master cue-man at both English Billiards and Snooker, Steve Brookshaw from Plymouth. Brookshaw won this match by a deciding frame. This turned out to be a wake-up call for Symons who then rattled off five consecutive wins with the loss of just one frame to top group A. After Brookshaw’s fine win against Symons he seemed to lose momentum, this opened the door for James Height from Bristol, to join Symons in the quarter finals. The breaks in the group came from; Lewis Parnham from Gloucester (67), current overall champion Andy Neck (Devon) (72 & 81), Symons (57 & 58), Height (60 & 76) and Brookshaw a 50 clearance. In group B Michael Hodge (Newport) looked to be in solid form, winning all his six matches without dropping a frame to top the group and qualify. In close second place Aidan Murphy (Bristol) won five from six. These two players led the break tally in the group; Hodge (51,54,58 &60) and Murphy (51,52 & 67). Jamie Trump from Bristol the only other break-maker, posting a 58. Group C proved to be the most closely contested of all the groups with three players winning five out of six matches; Ben Hancorn from Bristol, Jay Bullen from Devon and Tunney. Early on Hancorn stamped some authority on proceedings by making two century breaks in consecutive frames, a 104 and the best of the day a superb 114. However, a century only wins a single frame and by virtue of a 2-0 defeat, in the only match he lost, he failed to qualify. Whereas both Bullen and Tunney picked up one frame each in their ‘lost’ matches. This left Hancorn with a consolation prize for the best non-qualifier break. Other breaks in the group came from Ian Desmier (Somerset) (54), Bullen (51 & 69) and Tunney (69 & 73). Group B was pretty much dominated by Darran Lock (Cornwall) and Haydon Pinhey (Plymouth) who finished in first and second respectively. Derek Murphy from Bristol was not far behind, his only losses being to Pinhey and Lock. Breaks were posted by Pinhey (58 & 60) and Connor Benzey (Hampshire) (68). The knock-out stages began with the quarter finals. Symons was made to fight all the way for his close win over Bullen whilst Hodge, after a string of twelve frames undefeated, lost to Pinhey. Tunney posted a fine 74 break in beating Height as did Murphy (Aidan) a 79 break to beat Lock. In the semi-finals Tunney posted his intent against Murphy with a 59 break. However, Murphy won the decider to end Tunney’s run. At this point, with the ranking table being so close, Tunney was not aware whether he had gained enough points to win the overall Gold Series title, as final checks would have to be carried out at the end of the tournament to confirm the standings. On the other semi-final table Symons despatched Pinhey with the aid of an excellent 90 break, this won him the highest qualifier break, to reach the final. In the previous Gold Series event Murphy had set an all-time record as the youngest player to reach an event final and now he had set another benchmark by reaching consecutive finals, whilst still only fourteen. Could he go one better and win the event? In the final Symons was not punish by Murphy for the few mistakes that were made and won the event. A valiant effort by Symons and what a prospect Murphy is proving to be! After all the results where calculated Alan Tunney was confirmed as the overall Gold Series Champion with Andy Symons a close runner-up by 218 points to 215. All that is left to close complete the Gold events is for the top sixteen ranked players to come together and compete for the Gold Masters title on the 6th April 2019 at Frames Snooker & Pool club, Weston-Super-Mare. The sixteen players, in order of merit are: Alan Tunney (Torquay), Andy Symons (Devon), Haydon Pinhey (Plymouth), Aidan Murphy (Bristol), Darran Lock (Cornwall), James Height (Bristol), Steve Brookshaw (Plymouth), Mike Hodge (Newport), Andy Neck (Devon), Dale Branton (Plymouth), Jason Whittaker (Torquay), James Lee (Torquay), Billy Ginn (Exeter), Daniel Hall (Swindon), Connor Benzey, (Hampshire) and Chris Coumbe (Plymouth). Both the Gold Series and Gold Masters are sponsored by Totally Reward. Players interested in entering WEBSF events or potential volunteers willing to get involved with the work of the WEBSF they should contact Steve Canniford, Mobile 07891940995 or visit http://www.websfsnooker.com or WEBSF Facebook. Thanks to the sponsors Totally Reward and Jesters Snooker Hall, Swindon for hosting this event.